This is actually quite funny. Check out this app from Ecoshop Holding, LLC that is meant to detect swine flue. Or is it... Well in actuality it's solely meant for entertainment purposes only. 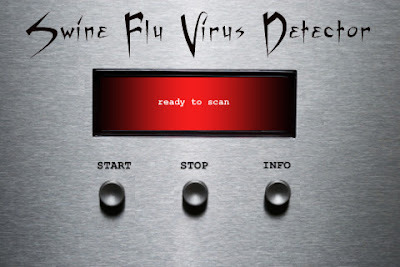 But you can download a real application and voila--you have a stunt double Swine Flu Virus Detector in your iPhone. Upon pressing the start button, the app begins to make some funky electronic robotic noise, and once it has finished evaluating the premises or the body you are testing, and the diagnosis is complete, if it is negative it simply states, "No virus detected," however if it comes out positive, not only does it say, "Virus detected," but there is a simultaneous squeal from a pig shrieking to tell you have swine flu! Enough said.